Nappy rash is a common thing on babies, it is something that my youngest daughter has suffered with on a regular basis, especially when she is teething. I have tried my fair share of creams to try and protect her from this and to ease the soreness but a lot of them I have found to not do what they claim to be able to do. I was more than willing to review the new nappy rash product from Sudocrem when I was asked to. This Sudocrems first new nappy rash cream in over 80 years, so they have definitely taken there time in perfecting their product. * Creating a protective barrier. This is done by sealing in the skin's natural moisture and in turn protects even the most sensitive skin from extrenal irritants. Sudocrem Care and Protect contains vitamin E and pro vitamin B5, these vitamins help the skin stay soft, moisturised and healthy. The pro vitamin B5 is also known to act as ananti-inflammatory on your skin so aids in stimulating the healing process. This ointment acts a barrier, protecting from things such as urine, any chemicals in nappies and any chaffing and rubbing. 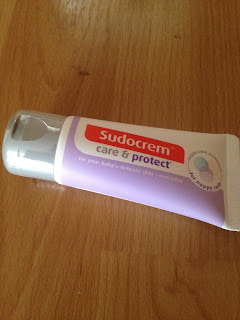 I have used Sudocrem in the past and I have to admit even though it did the job in getting rid of the nappy rash, I was never a fan of it a) getting into the tub whilst trying to hold a baby still can prove difficult, b) I was always left covered in just as much sudocrem as my baby's bottom was as it doesn't run in. 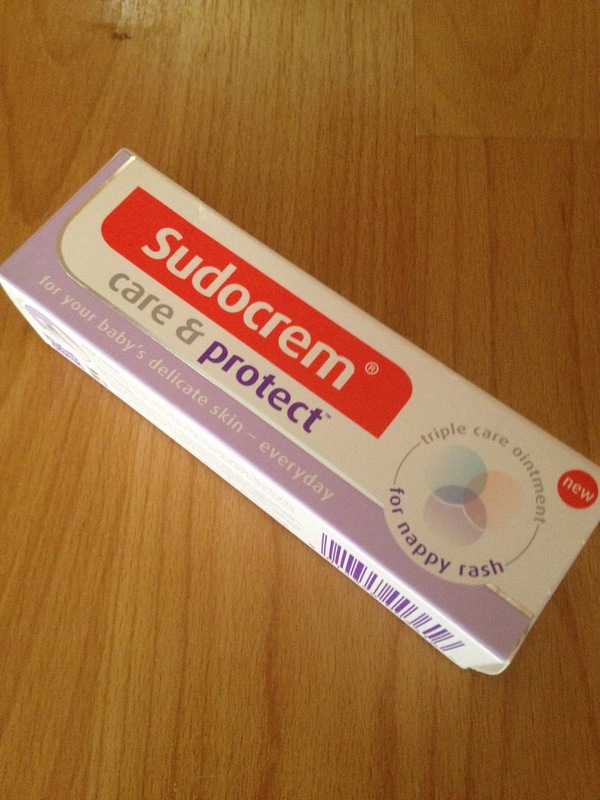 Sudocrem Care and Protect is a refreshing take on the original. It is easy to apply, just glides on, you don't need too much of it, as a little spreads a long way and was extremely happy to find that I didn't have it left all over my hands after putting it on Layla's bum. The cream itself smells lovely too, I think I detected a hint of Lavender, I suppose I would describe it as soothing. I was happy to see that is hypoallergenic as I have a family that suffers from eczema but not only that, it is free from artificial colurs, preservatives and nut oils, making it perfect for delicate little bottoms. The other thing they have really thought about is the packaging. This nappy rash ointment comes in a soft plastic tube with a hinged flip top which can easily be opened with one hand, no struggling to undo something as baby crawls off in the opposite direction and it also means you can't misplace the lid, which is something I have done time and time again. I have to say I think Sudocrem Care and Protect definitely does what it says and was most certainly worth waiting 80 years for. Priced between £3.99-5.99 depending on the size of tube you buy, I think it is great value for money, as a little really does go a long way!! Now not only have Sudocrem got a new cream, they have also got a new mascot which they are asking their facebook fans to suggest a name for, the 2 favourite entries will win a holiday worth £1000!! If you would like to join in with this competition head on over to their facebook page for more details. It isn't cheap, but then it does work I guess! It would be easier in this form than the old one which is too thick. Sudocrem is an old favourite in this house, and we love this new version too!